The Wait To Get Medicaid Help Can Be 7 Years In Kansas : Shots - Health News Nick Fugate has a cognitive disability, but held a job and was independent for years. Then he lost his dishwashing job and learned there are long delays getting help he needs from Medicaid in Kansas. Nick Fugate (center) with his parents, Julie and Ron, has been adjusting to life on Kansas' waiting list to get life-assistance services through Medicaid. For 22 years, Nick Fugate washed dishes at a local hotel near his home in Olathe, Kan.
"There was nothing easy," he says, and chuckles. "I just constantly had to scrape the dishes off to get them clean." Fugate recalls minor annoyances like the long days and the hot kitchen. The work did sometimes get tedious, he says, but he didn't really mind. "Just as long as I got the job done, it was fine," he says. Nick's father, Ron Fugate, says the job was the key to the self-reliance he's wanted for his son ever since Nick was born with an intellectual disability 42 years ago. "From our perspective," Ron says, "having a job, being independent, participating in the community, paying taxes, being a good citizen — that's a dream parents have for their children in general." What Happens To Medicaid In California Under A Trump Administration? But things got tough last year when Nick lost his job and his health insurance. For the first time, he enrolled in Medicaid. 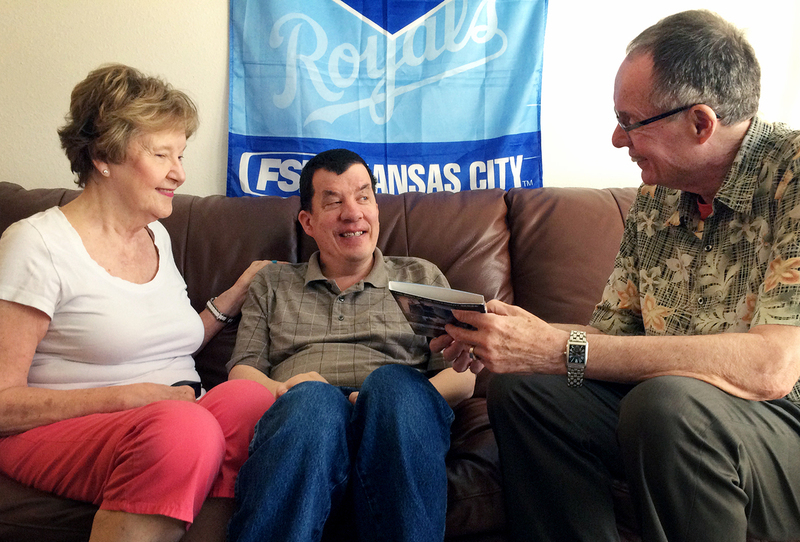 He got his basic medical care covered right away, but in Kansas, there's now a long waitlist — a 7-year wait — for people with intellectual disabilities to get the services they need. Decades ago, Fugate might have been institutionalized, but Medicaid now provides services to help people remain independent — including job coaching, help buying groceries, food preparation and transportation. Nick is eligible for these services, but while he's on the waitlist, he has to pay for them himself, out-of-pocket, at a cost of around $1,000 a month. Those expenses are quickly burning through his life savings. This year, families like the Fugates have been speaking out about that long waitlist and about other Medicaid problems at public forums like one held at the Jack Reardon Convention Center, in Kansas City, Kan., in May. In a basement meeting room hundreds of people with disabilities, their families and caseworkers railed against KanCare — the state Medicaid program. Some even heckled the moderator. The state has been gathering feedback because it needs the federal government's permission to continue running KanCare. In 2013 Republican Gov. Sam Brownback put KanCare under the management of three private companies that promised to improve services, cut waste and save enough money to end the long waits for the kind of services Nick needs. Two-and-a-half years later, many families say they've seen few signs of improvement, especially in terms of shortening the waitlist. In fact, it's actually grown by a few hundred names to about 3,500. And, except in emergency situations, the wait to get treatment averages seven years. But an end is in view, insists Brandt Haehn, commissioner for Home and Community Based Services, part of the agency that oversees KanCare. "I think everybody in the system is doing the best job they can do to provide the people services," Haehn says. In August, the department announced it had eliminated a different waiting list — the one for getting physical disability services. That claim has been challenged by advocates, who say many people were dropped from the list without notice. But state officials say the progress that's been made in speeding up the start of services for KanCare applicants who have physical disabilities demonstrates that the agency can get results. Haehn does acknowledge that cases like Nick Fugate's, of developmental disability, are more expensive and complicated than physical disability cases. It will take time, he says, to come up with $1.5 billion — the state's share of a $2.6 billion program — that's needed to make sure that, at least through 2025, everyone qualified for these important services can get them without having to wait. "Nothing would make me happier than to write a check and give all these people services, but that's just not reality," Haehn says. "So I have to deal with what reality is and try to use the money that I have to effect positive change in the most people." But Ron Fugate says KanCare had its chance. "We're not treading water, we're drowning," he says. Families like his are quickly losing lifelong savings, he says, and their life situations are getting worse while they wait for the state to provide services. "It's not getting any better," he says. "We've got to start taking some serious action on this and get it addressed. We've kicked the can down the road too long." The U.S. Department of Justice is investigating the waiting lists, although it declined to comment for this story. The ability of the state of Kansas to act may be limited. Gov. Brownback's tax cuts, which he initiated to boost the economy, have instead blown a hole in the state's budget, leaving little money to apply to something like reducing the length of the KanCare waitlist. Meanwhile, Ron Fugate and other advocates have been studying the ways Missouri recently eliminated its waiting list for similar services, in hopes of persuading Kansas legislators to adopt the same strategy. Ron and his wife are both in their 70s, and say they're now watching their carefully laid plans for their son's future slip away. "After 22 years, it looked like he was going to be able to complete a career," Ron says, "and it didn't happen that way. All of this comes at a time in our lives where we're in the waning seasons. We did not anticipate this kind of a challenge at this point." Kansas submits its application the federal government to reauthorize KanCare this month. This story is part of NPR's reporting partnership with KCUR and Kaiser Health News.